On 3rd April 2016, I was amongst a group of Travel Department tourists who departed Dublin Airport on an Etihad ticket bound via Abu Dhabi and Bangkok to Yangon, largest city and old capital of Myanmar, the country formerly known as Burma. It’s a country I had for some time hoped to visit, inspired by its lack of a presence on the tourism beat. In preceding years travel was deeply discouraged by pro-democracy leader Aung San Suu Kyi, but things were changing. She came into a position of quasi-power virtually the day we arrived, following elections and agreements, and the birth of a new democracy had taken place with all the potential which this brought. The military was still to be a part of the government, at least for the time being. 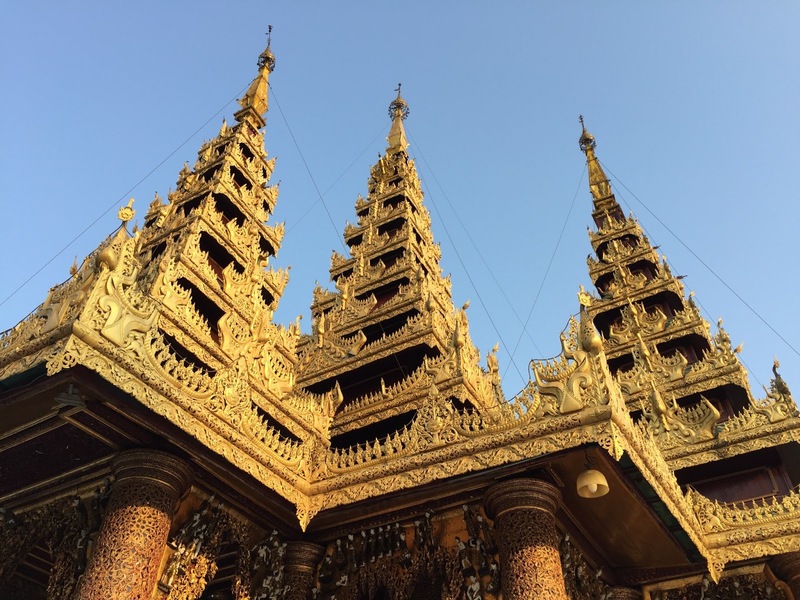 As the airplane approached the runway at Yangon we flew close to an impressive golden pagoda, the first of many I would see during the trip. At the airport we were met by Moh Moh, our guide who turned out to be a very caring individual, a mother hen who went beyond the call of duty when it came to looking after our needs. Our bus had a picture of comical Mr. Bean in the driver’s window, giving the impression that Bean himself was driving the vehicle. It soon became apparent that traffic congestion is an enormous problem in Yangon, and that it takes considerable time and patience to drive even a short distance. There are no yellow boxes, so jams occur everywhere, and traffic lights are ridiculously biased in many places such that vehicles are at a virtual standstill. It amazed me that all the cars I saw were unblemished by evidence of any collision dents. After a journey short in distance but long in time, our group of 19 arrived in the impressive modern Sedona Yangon Hotel. 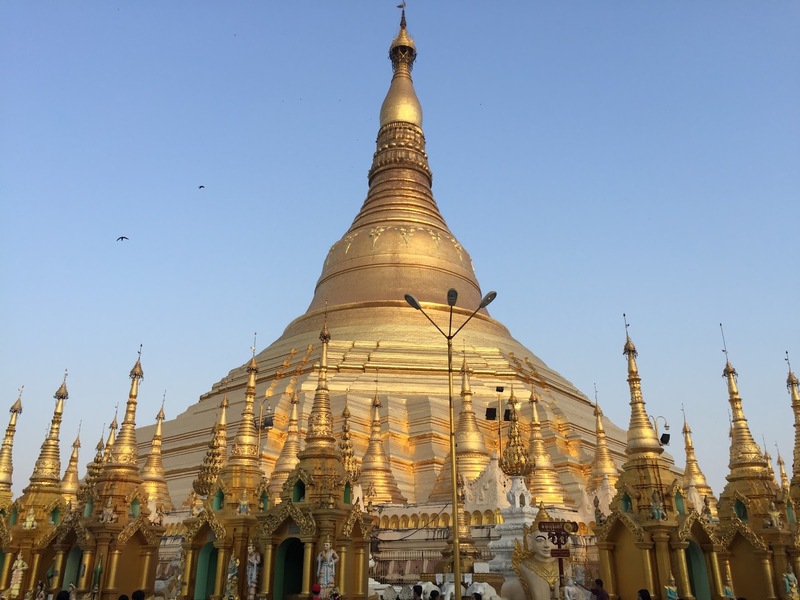 A morning snooze was followed by an afternoon trip to see the glittering gold complex of the Shwedagon Pagoda, which simply breath-taking. 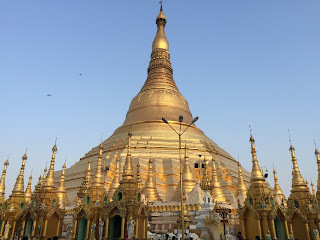 At its heart is the immense golden stupa which is surrounded by an array of diverse gilded shrines where statues of Buddha are venerated by the legions of the faithful. Devotees busy themselves by presenting flowers, lighting candles and incense sticks, inserting money in the large glass boxes in almsgiving, and pouring water over Buddha in veneration. Some chant in prayer whilst every now and then a line of young folk sweep the floor with a brush six people wide. Everybody is barefoot, and we were soon to realise that half our holiday would be spent shoeless in the multitude of pagodas and temples we were to visit. Shwedagon is the holiest place in Myanmar, and is to the nation of Buddhists as Mecca is to Muslims. At a nearby shrine we saw one of the country’s giant reclining buddhas. At some shrines a selection of the Buddha statues are crowned by haloes of glittering multi-coloured lights, which brought to mind slot machine arcades that one might find at Las Vegas, or back at home in the amusement arcades of Bray. To my European mind these looked quite undignified, quite unholy, but these gaudy flashing haloes symbolise Buddha’s enlightenment and are very meaningful to the faithful. The Sedona, as most of the hotels on this trip, provided a large well-appointed room with a large bed for a great night’s sleep. Breakfast was impressive too, featuring a great selection of dishes from fluffy omelettes, to croissants and pastries. I discovered that marmalade is quite a tradition in Myanmar, dating from the days of British rule. Great tasting baked beans featured in several hotels, produced in Myanmar. This morning the hotel offered an assortment of breakfast items from Korea, and I tucked into these straight after the omelette, bacon and beans. A nice belly full to start the day of touring the most populous city in the country. The morning was started by a by-pass of golden Sule Pagoda which is rather ignominiously encircled by a “basement” of shops. We stopped by City Hall and the High Court, from where I took a walk in the main city park. 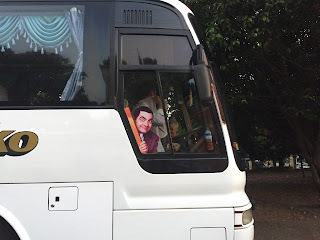 I was amazed by the performance of the conductors of the city buses, who would literally hang out from the door and frenetically scream out the names of the various stops ahead on the route. They would then pull the passengers on board in an effort to speed up the process. Guided by Moh Moh, we walked the streets of old Yangon, passing by various street food sellers, including a couple of stands where roasted crickets were on offer. 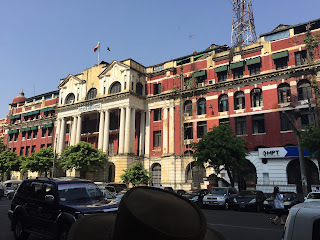 The old British colonial centre has some grand old buildings, in various states of disrepair. Not easy on the olfactory senses, the whole city has a characteristic stench of sewage, fragranced by the fermented fish condiment which figures in the local diet. We stopped by to visit the Scott Market, which specialised in stalls selling mainly fabrics, items of dress and jewellery. What caught my particular attention were the colossal fire extinguishers placed at intervals along the main beat. Our bus journeyed further through the city, and around one of the city’s two major lakes. The Bogyoke Aung San Museum is the house where Aung San Suu Kyi grew up, and we saw her wooden bed where she slept next to her siblings as a child. Her father, Major General Aung San, was responsible for ridding Burma of British rule, but he was assassinated for his efforts. His book collection remains on view in the house, and features plenty of English literary volumes, including works by Shaw. We stopped by the lake shore where a magnificent vista was enjoyed by all, from the rickety wooden lakeshore walk. The sun was setting over silhouettes of pagodas and palms in the distance, and a superbly impressive golden dragon-boat shaped restaurant took pride of place in the foreground, enveloped by beautiful purple jacaranda trees. After the two nights in Yangon we were obliged to be up and ready for departure by 5am for our domestic flight to Bagan. It was a simple matter of leaving our luggage outside the bedroom to door, from where it was transported for us, to appear again in the bedroom of the next hotel. This was done most efficiently throughout our trip. There was no check-in at the airport, simply a KBZ sticker to apply to our clothing to identify us as passengers as we were waived through and on to the modern ATR turboprop. KBZ is a bank in Myanmar which owns one of the domestic airlines. The safety cards are huge, almost the width of the seat. During the very short flight we were served a breakfast of pastries, a chocolate, orange juice and tea. Obviously they haven’t attended Michael O’Leary’s school of airline operation. 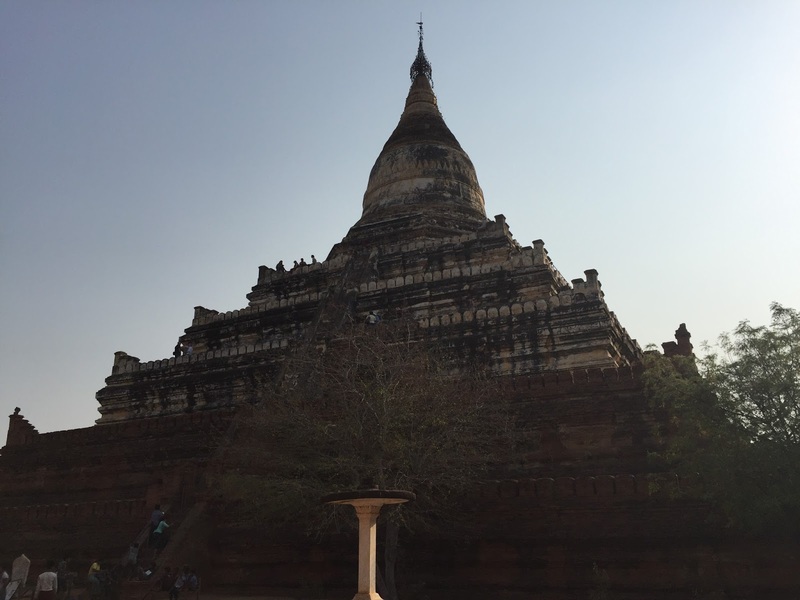 Bagan isn’t a city or even a town, rather an area of over 10,000 ancient temples and stupas which remain in pretty perfect condition. There is a small modern town located in the region, but the airport mainly serves those interested in visiting this extraordinary place which is peppered with an extraordinary medley of places of worship, most within metres of one another. It’s a spectacle the likes of which I’ve never seen before, so many are the monuments. Some are great and elaborate, some miniscule and humble. Some are white, others terracotta, some gilded. The sheer landscape of pagodas and trees is exceptional. Balloon flights are offered, but unfortunately there was no time to avail due to the ever busy schedule. Our first port of call was the impressive stone temple of Ananda Pahto with its vertiginous steps which I avoided. We also visited the beautiful temples of Gubyauknge and Htilominlo Pahto. The sheer amount of styles and rural landscape surrounding these buildings added to their eminence. Our hotel for the next few nights was Aye Yare River View Resort, a most lovely establishment spread out over a number of buildings, with a lovely freeform pool. On reflection I think this was probably my favourite accommodation during the tour. It had the cosiness of a small spread of grounds combined with the impression of the seclusion of the various buildings and curving pathways ornamented by plants and trees. Food was excellent which featured delightful fillets of river fish wrapped in banana leaves. One of my favourite aspects of the holiday was the visit to a farming village community, where the houses are made of bamboo. 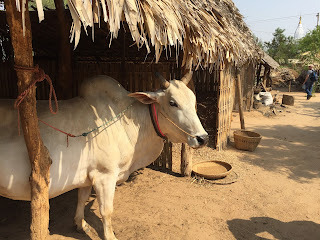 Each one has a yard where gentle white oxen shelter under bamboo awnings, and chickens roam freely. The oxen are employed in various tasks, one of them being to turn a peanut oil millstone. Everything in these communities is made by hand and labour, with everybody busied with the tasks of living a simple dignified life. We enjoyed the hospitality of one of these houses with a nice cup of tea and roast peanuts grown on the farm. It’s not exactly the most arable land, but supports the groundnuts, cotton, and some delicious small bananas, fruits and vegetables are grown in the area and sold in the local market. Tobacco is grown and crafted into charoots which are popular with the ladies. We watched the villagers at work on the various crafts, including that of producing the fast fermented and distilled toddy. In order to produce this men climb up the coconut palms, retrieve the fruits, collect the liquid and ferment it overnight for a quick distillation process. It is pure fire-water! The local bamboo library had no computers, but children were avidly reading their books as I peeped in. It’s quite a different scenario from the libraries I work in, and I don’t think my young customers would put up with books alone to entertain them. Then there was a visit to a lacquer workshop, where ribbons of paper are formed into the shapes of bowls, small and large, and the most fanciful of urns. They are skilfully dipped and painted in layer after layer of lacquer, with the final product a true work of art. 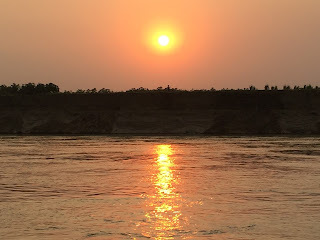 We partook of an evening sunset cruise on board a very dodgy vessel which was accessed across a narrow plank, with a helping hand from the boatmen. Health and safety is not yet a feature of this developing country, especially in the matter of boating, but I guess this might change for the better within the coming years. It was nice sailing down the Irrawaddy, with a low cliff bank to one said dotted with stupas here and there. We stopped off to visit a cave pagoda, and then turned around the face the setting sun. The following morning we left Bagan by coach in the direction of Mandalay, the second largest city in Myanmar. 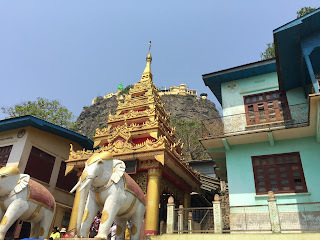 On the way we stopped at a major place of Buddhist pilgrimage, the great Mount Popa which is a flat topped volcanic plug upon which a monastery buildings were constructed. A large number of steps winds around the steep sides, with shrines placed along the way, rather like a “stations of the cross”. Below the mountain there is a medley of some quite fancy buildings, some of them serving as overnight accommodation for pilgrims. We saw a busload of young nuns arrive. These children can decide whether they wish to continue dedicated religious life when they reach adulthood, or like the majority, lead a secular life. 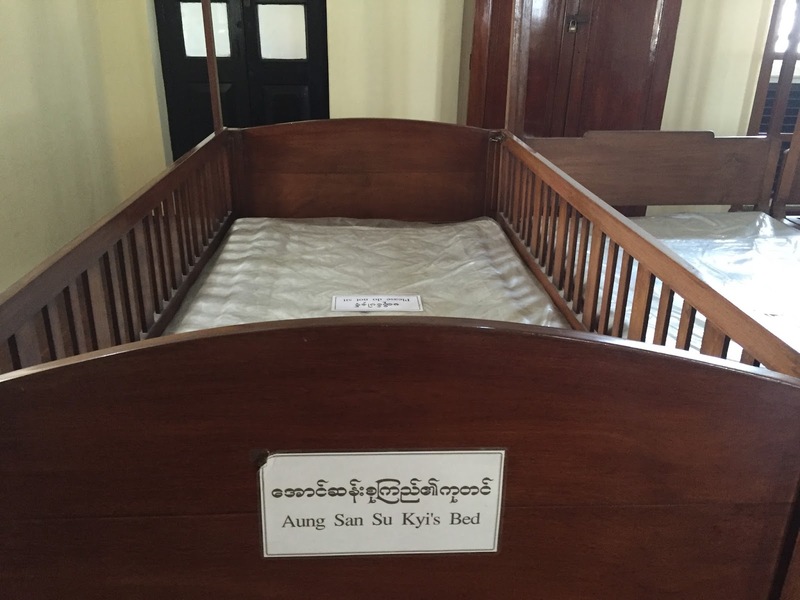 Same goes for the monks, who begin their novitiate as children. Like most religions, the males are considered more important than the females. It came time for lunch. Climbing the hills through a sandalwood forest we dined at the beautifully tranquil, luxurious and elevated Mount Popa Resort, the most deluxe of our lunch stops. Located on an elevation, we had a view across to the fine conical mountain of Mount Popa, upon which top lies the monastery. It is a magnificent sight. At the entrance to the resort are some fanciful carved teak tables featuring the shapes of snakes and dragons. We dined at more practical tables on the veranda. Roads are improving in places, and we continued our journey on a dual-carriageway. Driving conditions are generally somewhat better than, say, in India. 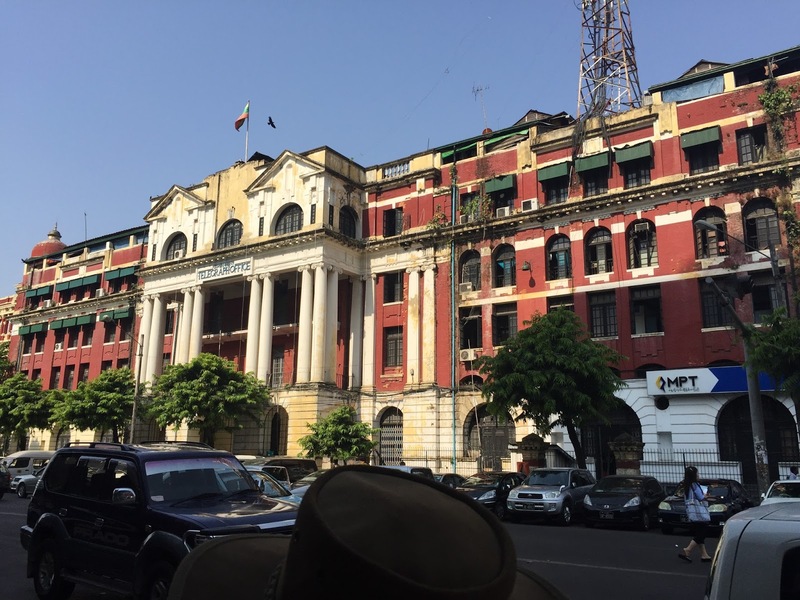 Arriving in Mandalay we were accommodated in the Sedona Hotel, equally as impressive as its counterpart in Yangon, having sizeable rooms, and a capacious pool which I took advantage of no sooner than I had arrived. As darkness had fallen and the pool was illuminated I enjoyed a swim without the scorching sun. Attentive staff handed me towels to dry off afterwards. Next day the temperature was at its highest during the entire trip, a high dry 45c. I was surprised by the way I coped with the heat, but this was helped by plentiful opportunity for shade in the workshops and temples. During our city tour we stopped on a street where hundreds of white Buddhas occupy the sidewalks in their various stages of completion. Women and men were busy at work chipping the blocks of stone into Buddhas for which there is an infinite market. A remarkable pagoda we visited is Mahamuni Paya, where sits the most revered and extraordinary Buddha image in Myanmar. Only the menfolk are allowed to go near it, the ladies amongst us had to contend with viewing it by cctv. The tradition is that the men buy an affordable patch of gold leaf and apply it to the great statue as a mark of reverence. This figure has so many patches of gold applied to it that it is ridiculously knobbly in appearance, which in my view renders it comical and extracts from its dignity. Late afternoon we proceeded in the direction of Mandalay Hill, which could be seen from the hotel. Just below the peak is Kudothaw Pagoda, wherein lies the World’s Largest Book with over 1.400 pages , each set in a marble tablet, every one measuring over five feet tall and enclosed in a little white stupa-like edifice. It all reminded me of rows of bright white mausoleums in a cemetery. 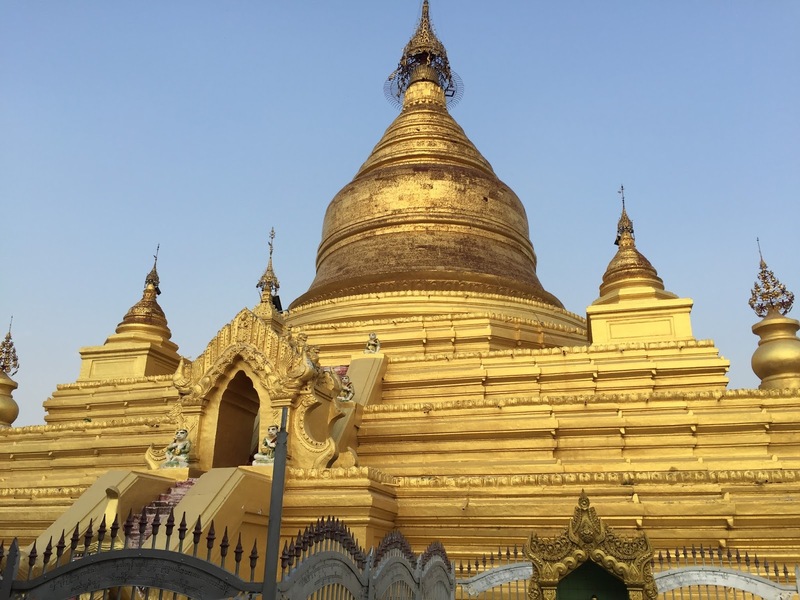 At the heart of the “cemetery” is the great golden stupa of the Pagoda. Stepping out of our tour bus, we boarded small rough vehicles which took us up the steep and narrow winding road with plenty of hairpin bends. At the top was were two towers, one with a lift, the other with a set of moving stairs to bring us up to the crown which is occupied by none other than (you’ve guessed it) a monastery . A floor of shiny hot tiles scorched our feet and reflected the dipping sun. There were great views looking out over the nearby Kudothaw Pagoda and the city beyond. We watched as the sun blazed red and dipped below the horizon. Later, a tiny passenger ferry brought us across a small tributary of the Irrawaddy to the remains of the old imperial city of Ava, which is now mostly a rural village with some nice remains. In pairs we stepped on board canopied carts drawn by a single small horse. We trekked past the village and out through some of the most delightful and bountiful countryside. Sunflowers, cabbages, sweetcorn, aubergines, coconut palms, oranges, banana trees, tamarind trees, and the most vividly green little rice paddies appeared to either side as the horses clip-clopped through the most intimate little earthen tracks. It was like a magical mystery tour through somebody’s private garden. Here and there we stopped off by a stupa, the remains of an old bathing pool of the royal estate, and the funny little “leaning tower of Ava”. Our good-humoured cart-driver chuckled with mirth at the comparison with the more famous one in Pisa. Our last stop in Ava was at a great elaborate stone monastery guarded by a pair of stone lions at the gate. Back on board the tour bus we made the final stop of the day at U Bein Bridge, which is the longest teak bridge in the world. Purely a footbridge it is fairly narrow and has no rails, but the off great wooden post punctuates the vacuum and provides some sense of reassurance of there being “something to hold onto” if needs be. The bridge is always quite crowded, especially with tourists who often stop in pairs and groups such that one has to negotiate one’s way precariously around them. The riverside provides an interesting scene with boats and shacks on one side and a farm of geese on the other, with hives of activity peppering the serene waters. Next morning we departed Mandalay on board a very brief flight. Touching down at Heho Airport, we had arrived in Shan state. At some elevation, the area felt that bit cooler, and was a blessed relief from the intense heat of Mandalay. The red soil is so much more fertile here in the undulating landscape. 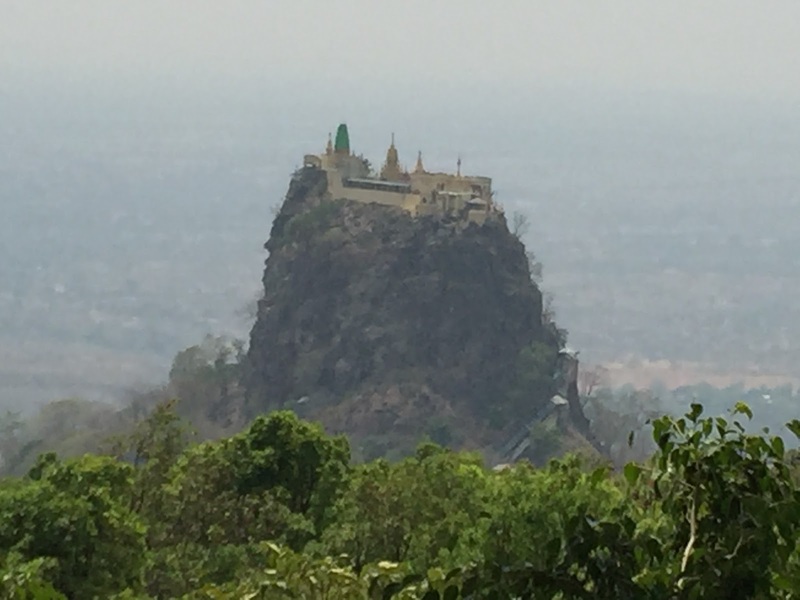 Our first stop was at the Shwe Oo Min natural cave pagoda at Pindaya. The cave is in a great hill, with a very high key entrance complete with giant spider effigy. It looks more like the entrance to a theme park than a religious shrine! But we’d been there before several times with the “arcade buddhas”. 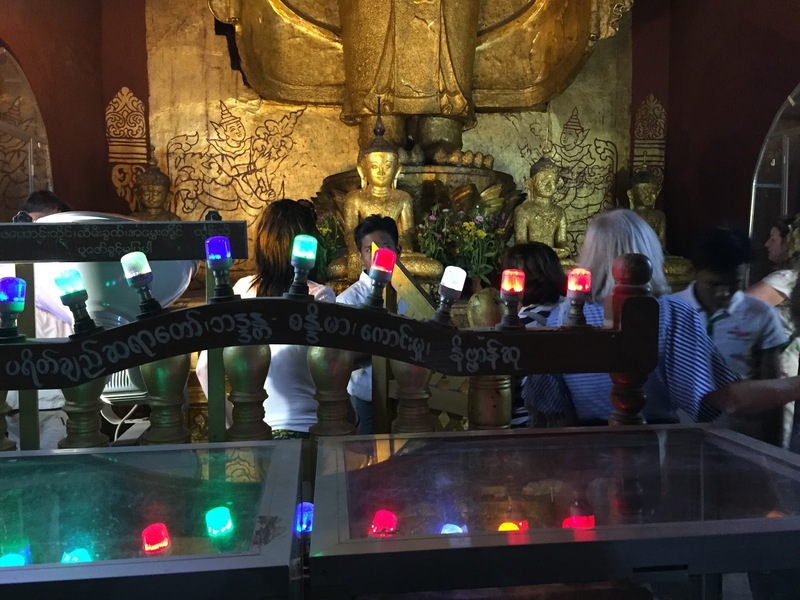 Over 4000 gold Buddha statues occupied the fascinating labyrinth of passages in this sizeable cave system, with various hues of lighting in in each cavern. The area has several ethnically distinct tribes which live in harmony among one another. It was fascinating watching the various homesteads as we passed by on the coach, with virtually every home having its collection of livestock, and features of their own ethnicity. On our way to our mountain retreat for the night we passed by the old British railway post of Kalaw with its very English style railway station. The Hill Top Villa Hotel was our stop for one night, where we were accommodated in simple but pleasant bungalows with beautiful views over the floral gardens to the verdant hills. I enjoyed sipping some locally bought and produced rose wine on my veranda, watching the evening fall on the verdant hills whilst the lights in the hotel gardens lit up and sparkled. After a simple al fresco breakfast of omelette, juice, breads and marmalade we travelled down towards tranquil Inle Lake. We visited a Shan paper and umbrella making craft centre. Also we called into a pair of monasteries side by side, one stone and one wooden, the latter featuring a couple of delightfully friendly cat families who resided within. Mother cats and their beloved kitten occupied pride of place, being cared for by the monks. Drawing up to a canal by Inle Lake I was slightly nervous when I saw the narrow motorised canoe-like boats we were obliged to step aboard. Watching others stepping onto their wobbly vessel, I observed how swiftly it departed down the narrow canal. However I soon became confident when I was comfortably seated, as the boat sprinted and harmlessly bounced off another as it paced towards the open lake. Floating gardens appeared either side of us, with water-lilies aplenty, and bird life manifest. I felt elated as the boat entered the broad waters of Inle Lake. At times the spray became extreme on one side, but the solution was right beside me as I picked up and opened the umbrella which was located at each seat. Looking back with an eye to common sense I think it would have been wise for each of us to don the life vests which were provided on every seat. Now and then we would speed past clusters of purple water-lilies. In the distance I could see the local fisherman performing their ballet. As my boat drew closer I could clearly see one fisherman standing at the stern of his narrow little boat and tip over with his bell-shaped fishnet as he rowed the vessel with one leg. That’s why I describe it as a ballet; it is quite an extraordinary performance, a local tradition confined to this lake. Many such ballet-fishermen were performing on the leg. We stopped off for lunch at one of the many restaurants which stand on stilts over the water. Crisp fried flatbread, crispy little baby vegetable tempura, pumpkin soup, an array of meat and fish curries, stir fried daintily cut veg, and rice covered with gold leaf. A typical Myanmar luncheon feast, but the edible gold leaf was a first. Back on board the boats we were brought to some fascinating craft workshops. The most expensive fabric of all, we watched lotus thread weavers producing from start to finish the strong and enduring product. It is an incredibly painstaking process, especially the retrieval of the incredibly fine threads from the stems of the aquatic plant which thrives in the lake. Returning to the waterside we saw a small pig being transported upside down with legs tied to a pole, from a boat to a nice sun-sheltered canopy where he would be reared for fattening, I managed to get tickling the snouts of some friendly swarthy piglets who were guzzling noisily from troughs under ample shelter. As we entered the narrow channel through the vast reed beds towards our final hotel, Pristine Lotus Spa Resort, our boat’s propeller got tangled in some reeds and we came to a halt. With a little assistance from another vessel this situation was remedied and our engine once more fired into life, bringing us to the enclosed mooring harbour of our resort-style hotel. The bedrooms here are most interesting. Each one is built in the shape of a wooden “boat” with the bow end forming a balcony with a seated deck overlooking a canal toward the lake, with an ample bedroom with feature sunken bath, a settee, a large bed with mosquito nets, and an open bathroom area with curtained toilet. Reception building is separate to the bar/restaurant buildings and pool area. Another part of the campus is across the reasonably busy marrow road. Today was the beginning of the Buddhist New Year and the tradition is to throw water over other (“willing”) “participants”. In effect The staff and residents of the Pristine Lotus took part in throwing buckets of water over any passing motorist passing on the road between the two sections of the resort. I enjoyed a swim in the pool, followed by a cocktail and delicious dinner in the restaurant. Last day, we took a short trip by bus to the nearest village where many people bathed in a lake inlet; a walking tour via a linear sheltered market brought us to a place of a myriad ancient mini temples and cemetery. Another motorised canoe trip took us to lunch. The final afternoon was at leisure with a visit to the natural hot rock spa. In the evening, all I, and practically everybody else, could face was a place of delicious crispy chips with ketchup and mayonnaise. Myanmar can do simple fries as well as the best in the world. The journey homewards started with a morning domestic flight to Yangon. The airport at Yangon, a work in progress, has just a few stalls which sell souvenirs to take home, a whiskey shop and one café. Surprisingly this café served me the best coffee I have ever enjoyed in my life, and the food on offer looked absolutely delicious. Coffee is grown in Myanmar and packaged as a souvenir which boasted "Italian coffee from Myanmar” in an effort to reassure the consumer that it was a quality product. Some hours later we boarded the Bangkok Airways flight to Bangkok to join the Etihad flight to Dubai. Another Etihad flight brought us back home to Dublin, where I wished my bright pink case off the carousel and out into the perishing cold outdoors of Ireland.